CitizenTube: YouTube in Russia: "Whatever it was, still is - News." YouTube in Russia: "Whatever it was, still is - News." 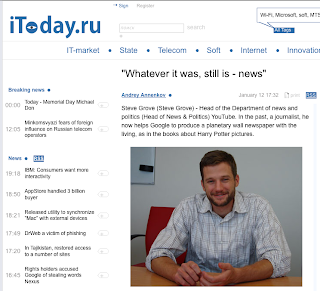 Okay, so Google Translator didn't quite get the title right (I'm not sure what "Whatever it was, still is - News" means exactly) but you can still get the gist of the conversation we had with iToday.ru in our recent visit to Moscow in this Q&A they just published to their site. My conversation with Andrey Annenkov was one of the more fascinating ones I had in Russia. A thoughtful journalist who's concerned about the state of the media in Russia, Andrey asked several questions about YouTube's role the news today, which he laid out well in his post. Many Russian journalists I spoke with, including Andrey, tend to think that due to the youth of the Russian media industry, their audiences are less sophisticated than ours and therefore more susceptible to "bad" information - so the flood of unverifiable content on YouTube makes them nervous. In addition, Andrey and others were hard to convince that YouTube didn't have a political agenda - most every Russia newspaper does, so how can a platform like YouTube really be just about free expression when it comes to politics? Andrey's first question to me was, "So, Google is getting into journalism now?" When the interview was over I asked him whether he thought the net benefit of a platform like YouTube outweighed the challenges it presented traditional media platforms, and he said "yes" without hesitation. The challenge, he felt, was showing the Russian government that technologies like YouTube make a difference in the public debate over issues. Maybe more videos like the viral confessional by a disgruntled Russian policeman late last fall will help shift that perception.